The latest batch of filings from Pennsylvania regulators, consisting mostly of hikes to insurance prices, means that consumers retrieving an auto insurance quote online could see a handful of new, higher rates. The following filings were approved and take effect this month. Two companies under the Progressive banner will be increasing insurance rates, both by 6.8 percent overall. At Progressive Casualty, that change amounts to a $50.70 increase per policyholder on average. At Progressive Northern, it amounts to a $70.29 average increase for each policyholder. The Progressive increases take effect Oct. 5 for new policyholders but won’t affect those renewing policies until Nov. 14. At least 24,000 Progressive policyholders will be affected by the change. 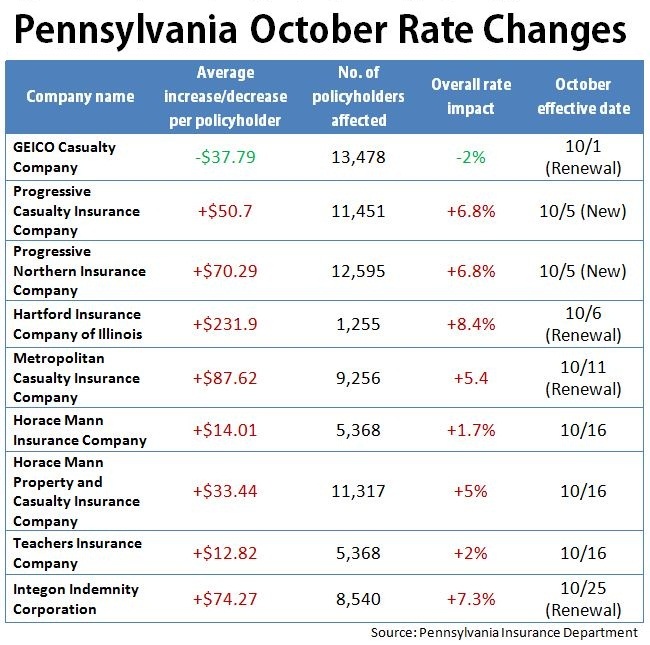 Horace Mann and subsidiaries Horace Mann Property and Casualty and Teachers Insurance Company will all be implementing rate increases that will go into effect for all policyholders on Oct. 16. Horace Mann’s 1.7 percent increase overall means about a $14 average increase for each of the 5,370 policyholders affected. Horace Mann Property and Casualty raised overall rates by 5 percent for about 11,300 policyholders, amounting to a $33.44 average increase for each. At Teachers, rates will be hiked by 2 percent overall, amounting to an average $12.82 increase for about 5,370 customers. Hartford of Illinois showed the largest average increase per policyholder, at $231.90. The 8.4 percent overall rate increase takes effect on Oct. 6 for both new and renewing policyholders but will only impact upwards of about 1,250 of them. Integon Indemnity reported the second-highest overall rate increase out of the filings, at 7.3 percent. The 8,540 policyholders affected will see an average increase of $74.27. Out of this latest batch of filings, Metropolitan Casualty also reported a relatively large average increase for each policyholder. The insurer’s 5.4 percent increase impacting 9,250 policyholders means an average increase of $87.62 for each policyholder. The changes are effective Oct. 11 for renewing policyholders and are already in effect for new customers. GEICO Casualty has decreased overall rates for 13,480 policyholders by 2 percent, amounting to an average decrease of $37.79 per policyholder. The changes went into effect in August for new customers and on Oct. 1 for renewing customers.